getcalc.com's Starting & Running Current Calculator is an online electrical engineering tool to calculate starting, running & full-load current of 3 phase AC induction motor. 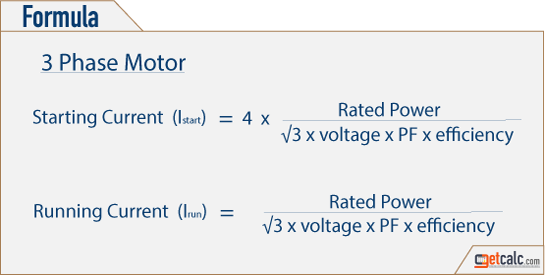 Starting & Running current are the three important factors for the rating of AC induction motor. Starting Current, sometimes abbreviated as Istart in electrical engineering, is a measure or rating of how much current required for a single or three phase AC motor to get started. It's generally, four times of running current. Similarly, Running Current, sometimes abbreviated as Irun is the current required for an AC induction motor to run freely with no-load after starting up. Similarly, Full-load Current, sometimes abbreviated as Ifull-load is the current required for an AC induction motor to run with its maximum load or rated power. The measurement unit for current is Amperes often used as amps.